CHARLOTTE COUNTY, Fla.- It was an emotional day at Charlotte Correctional Institution. Some kids got to see their fathers for the first time in months or even years. Children from Dade County traveled to Charlotte County to spend a few hours with their dads. 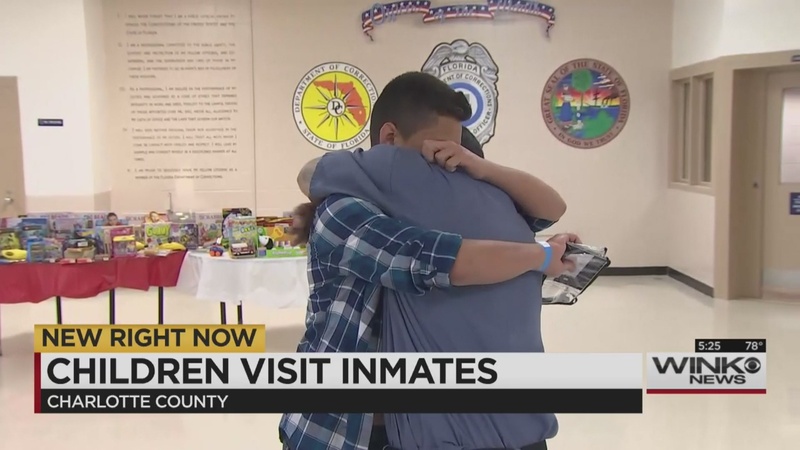 Some inmates were able to kiss and hug their kids for the first time. “I just love him so much, because I missed him, I missed him,” said Joseph Garcia, whose dad is serving 25 years in prison. “Every time I come in here, it’s like an overwhelming experience because he’s in here for a long time. We try to come as often as we can,” said Lenee Desamours. Desamours’ father is spending life in prison. Her family of five doesn’t let distance keep them apart. “We have a very tight circle. Their moms are supportive, so I’m blessed, I’m blessed,” said William Desamours. The visit was arranged by the Children of Inmates organization. For a few hours, the families got to play board games, sing, and dance. “This program helps you in terms of how you feel, like it helps you cope with feelings and miss a person, it helps you build yourself to it,” said Lenee Desamours. The fathers seeing their kids say it gives them hope that one day, they too can enjoy life outside of those walls. “I’ll be out there soon. After this, four and a half more… first and last. There will be no more, first and last,” said David Lopez, who’s serving 10 years in prison. Children of inmates visits Charlotte Correctional Institution four times a year. The State of Florida and Miami-Dade County help fund the organization.